Ulverston is a small town on the west coast of northern England just inland from the Irish Sea. Seagulls nag the town with incessant complaining, resentful caws. In Enid Blyton country. The centre of Ulverston. After arriving by train from Manchester Emmy and I hauled our suitcases up two steep and slot-narrow staircases to a garret under the roof of a traditional guesthouse, then went out in search of lunch. Ulverston’s narrow streets are flanked by picturesque, close-packed ranks of old two- and three-storey townhouses. The compact town centre seems dedicated to eating. Everywhere there are tearooms, cafes, snack bars, restaurants, pubs. We found a small tearoom in a side street and sat down to some delicious home-made cream of chicken soup. He looked gloomily out the window at the relentless sunshine. Then his face brightened and he made a surprising follow-up statement. This non-sequitur caught me off guard and I didn’t know how to respond, but luckily he didn’t wait for a response. Leaning unsteadily over our table he delivered a rambling lecture on the joys of postcard collecting. He looked disdainfully around the tearoom. His gloom returned and he looked into his plastic bag. He said the word “modern” with distaste. “But that’s life, I suppose,” and he shuffled out the door. It hadn’t occurred to me that collecting postcards was a metaphor for life. But as we paid our modest bill I thought maybe it was as good a metaphor as any. Certainly as good as “The Camino”. The prefabricated, stereotyped images on postcards and their scrawled messages from distant times and places, not to mention the ephemeral life of postcards and their secret existence in dusty albums captured much of the public and private worlds we all experience. Yes, postcards were like us. We left the café and stood entranced in the street. 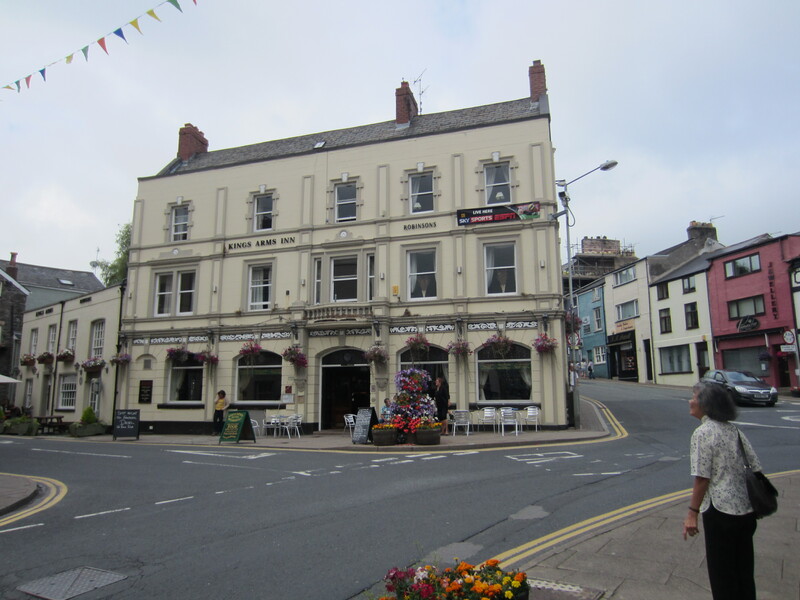 Ulverston was our first experience of a small English town and we liked what we saw. A fish and chip shop exuded its oily aroma from behind prim lace curtains, red begonias burst from window boxes, fat chimney pots squatted in threes and fours atop slate roofs. Truly this was Enid Blyton territory. At any moment the Famous Five – with their dog Timmy – would race down one of the cobbled streets in pursuit of smugglers. A Tibetan monk strolled past. I blinked. No, it was not an hallucination. It was a monk. He had close-cropped black hair and sandals on his feet. He was wearing a claret-red robe with yellow trimmings. He paused and looked with curiosity into the display window of a cured meat shop. More red caught my eye. There was another Tibetan monk… and another. In a kind of panic I looked up and down the street. There were Tibetan monks everywhere. Clearly something had changed in Ulverston. The Famous Five would never have stumbled into a ripping adventure that involved Tibetan monks. Later that night I learned why. Conishead Priory near Ulverston – a monastery for Augustinian monks founded in 1160 – had become derelict and had been taken over recently by the Kadampa Buddhist community. They had restored the monastery and built a spectacular Buddhist temple in its grounds. On the day we visited Ulverston an international Buddhist festival was taking place at the temple attended by 4,000 delegates from all over the world. As we dined that night in an Indian restaurant we were surrounded by Buddhists munching on the vegetarian menu. Most of them had American accents. Behind us two of them in the garb of Tibetan monks debated the best combination of flights for their return to the United States. Their close-cropped heads of black hair touched as they pored over airline timetables through an app on an iPhone. At 8.30 the following morning Emmy and I strode to the small monument on the edge of Ulverston that marks the beginning of the Cumbria Way. Conditions were good for walking: warm, overcast, a little humid. We were in high spirits. Our first day on the Cumbria Way would be a good day. I could feel it. But I should have called a taxi, or gone back to bed. A bad day was about to happen. At first the Cumbria Way greeted us with a friendly face. We walked along a rocky path under the thick foliage of overhanging trees following lines of rough stone walls. The path ran out and we graduated to unmarked trajectories across open fields. The long wet grass squeaked under our boots and soaked the ends of our trousers. We clambered over stiles and picked up a path again. It rose steeply into pasture-clad hills, taking us through farm gates, across the muddy compounds of farmsteads, through fields of calmly grazing sheep, and over yet more stiles. Some of the stiles were made of wood, but most consisted of stony steps jutting from slate-rock walls. Two or three times we had to strip off our backpacks and pass them over the wall, then negotiate the steps of the stile like it was a mini rock-climbing exercise. … and over stiles (lots of them). Ahead of us lay a series of reassuringly cosy place names: Old Hall Farm, Beck Side, Hollowmire, Nettleslack, High Stennerley, Tottlebank, Appletree Holme. But as we climbed higher and the vistas panned out to rugged distant horizons the cosiness vanished and the Cumbria Way turned nasty. The pasture ran out and menacing, crouching bracken crowded around us. The path became boggy, then tangled, then indistinct. High on the heath there were no farmhouses and we were utterly alone. Bracken closes in, and we’re in trouble. We trudged on, stopping often to consult our map. I cursed my foolishness for not bringing my eTrex GPS device which had a compass in it. I had assumed that the Cumbria Way would be as intensively sign-posted as the Camino. But there were no wayside markers here, and I recognised none of the landmarks on the map. Slowly I had to admit to myself that we had strayed from the track and were lost. It was around two o’clock in the afternoon. We had been walking for five hours and fatigue was starting to slow us. We had to find a farmhouse and get help. Below, in the far distance, I saw a strip of greenery. 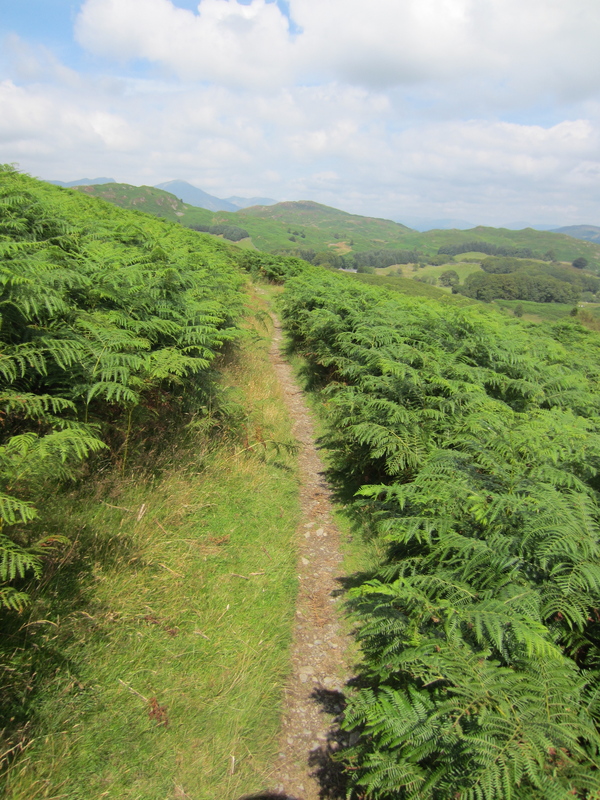 It looked like farmland so we headed downhill, pushing through bracken until we met a stream and crossed a barbed wire fence into some fields. We came across a slate-stone farmhouse, but it was derelict. We pressed on and walked into the back yard of another slate-stone farmhouse. There was no-one at home, but a narrow asphalt road led away from it and we were grateful to tread its smooth surface. We walked for around two kilometres through deserted countryside. Then, around a corner, we came upon a miracle. It was a white two-storey house – bright chintz curtains in the windows – standing amid fruit trees and roses behind a neatly trimmed lawn. A middle-aged lady was sitting in the sunshine on a garden bench with a young man beside her. I called out over the garden wall. Instant consternation. The lady sprinted across the lawn and opened the garden gate. Shooing away her big, glossy black dog, she ushered us into the house. She was a model of brisk, very English, hospitality. Two big glasses of water appeared before us and a map was spread out on the table. It was at once clear where we had gone wrong. We had walked along a high flat ridge and descended on the wrong side. We were at least ten miles from the Cumbria Way. Lucy issued orders to her son (he was on holiday with her), a car was backed cautiously into the narrow lane in front of the house, and we were driven back to our path. It was a surprisingly long drive – almost half an hour squeezing along impossibly narrow roads to the southern end of Coniston Lake. But we were back on track. Our very warmest thanks to you, Lucy and Rob! It was now mid afternoon and we still faced a lakeside walk of nine kilometres north to the village of Coniston. My feet were hurting and Emmy was drooping with fatigue. We walked with our heads down, doggedly, oblivious to the tree-lined beauty of the lake. Around five thirty we made it into Coniston. We had been on the road for nine hours and I estimate we had walked almost thirty kilometres. In our room at the Lakelands Guesthouse I removed my boots. The anti-blister plaster on my left little toe had come loose. I peeled it off and the toenail came away with it. Fortunately my toe was still attached to my foot, a fleshy, swollen, nail-free appendix. I flopped back on the bed and took stock of the day’s events. 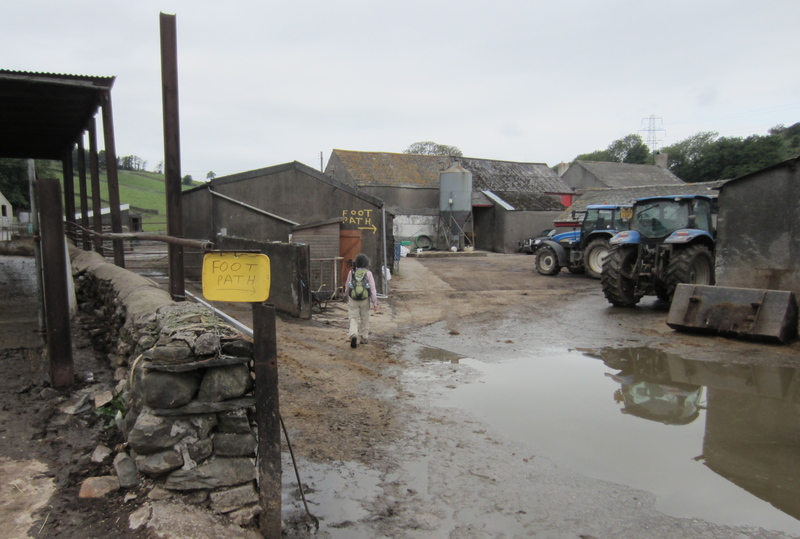 The glitzy advertising of the Cumbria Way and our relatively straightforward experience of walking the Camino had lulled me into carelessness. 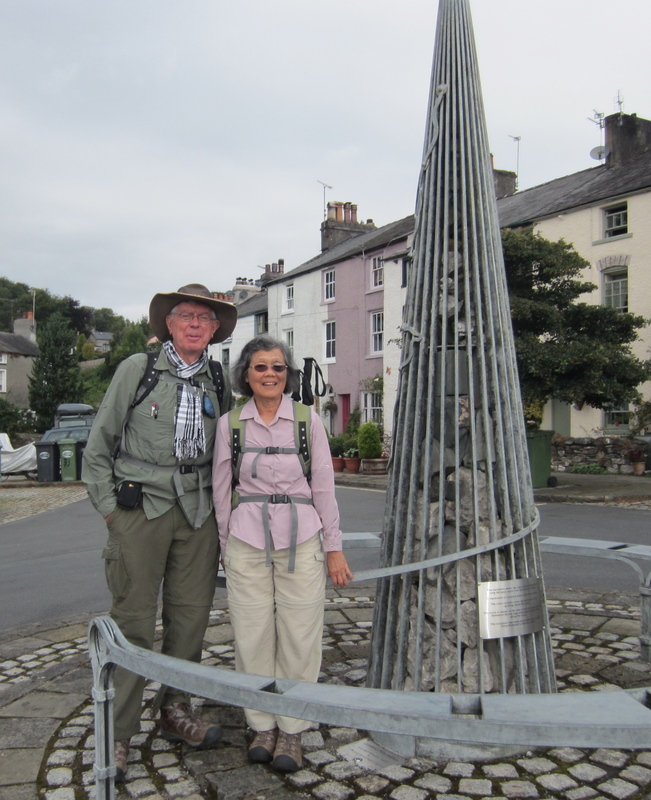 The Cumbria Way was a true hiking challenge. It was not, perhaps, a true wilderness experience (there were sheep grazing everywhere, even in the remotest parts of the Cumbria Way) but nevertheless it was a challenge that demanded good physical condition, the right equipment and the right mental outlook. I had the first two (although I had forgotten to carry my compass) but the third component was missing. For my shortcomings of mind – my unthinking overconfidence – I had been punished by the law of karma that governs the fate of all long-distance hikers. In retrospect I should have stayed in Ulverston and headed for the Buddhist festival. Maybe there I could have got some insurance against my karmic shortcomings. I sat up and looked at my toe. In the morning I would have to visit a doctor. But these things make such good memories several years later. They also make good blog-reading immediately!